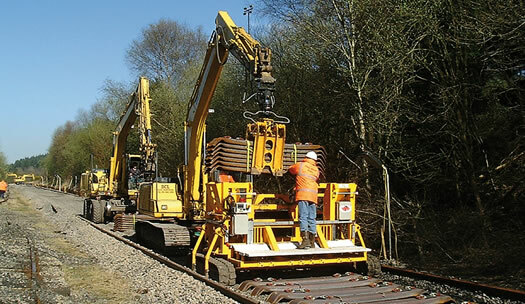 Unique, innovative GOS designed equipment for the efficient, safe laying of all types of steel sleepers on prepared ballast beds. Removes up to 95% of the man handling normally required for laying steel sleepers. Additionally, increases productivity by 40% when compared to traditional methods. To provide enhanced safety (and complete system compatibility when using the sleeper layer) the Network Rail Product Approved GOS Steel Sleeper Grab model SG should ALWAYS be used in conjunction with the sleeper layer. When attached to a suitable Road Rail Vehicles, the grab is used to load steel sleepers into the layer. Towed behind a suitable road/rail vehicle, the steel sleeper layer operates with pneumatic energy from a petrol engine driven compressor. The steel sleeper layer has a fully automatic system that drops the sleepers at 650mm spacing. This can be altered if required, to suit the specific application, by the use of different diameter measurement wheels. There is also an electro-manual and manual backup system, thus ensuring that the sleepers can always be laid during the shift. Available for hire from GOS, complete with fully experienced RPA certified operator.